Citizens for Sustainability: Meeting-Forum, Sat., Feb. 13, 10am-noon, Silver Lake Village Community Center, 3301 Silver Lake Rd. Many old timers (like me) recall hearing the Sons of the Pioneers singing the song Cool Water in Roy Roger’s cowboy movies during the 40s. It’s easy to appreciate the thirst-quenching reward of cool, clear water that hot, dusty, sweaty cowboys relish when trekking on long, demanding cattle drives. Because our bodies consist mostly water, up to 65% for men, the recommended minimum daily consumption for maintaining proper hydration is approximately 6-8 glasses of water daily. Failing to ingest enough water-based liquids can lead to severe physical and psycho-emotional health problems. What would we do without wonderful cool, clear water, this most precious liquid that many have considered “liquid gold.” Sadly, as the media increasingly reports, this essential element for sustaining life is in jeopardy worldwide. According to Water Facts, twice the population of the U.S. lack access to safe water, and 1/3 of the global population lacks access to toilets. In low and middle-income countries, 1/3 of all healthcare facilities lack a safe source of water. With the accumulating effects of climate change, increasing world population, and degraded soil of diminishing farmlands, the availability of fresh water is becoming a major concern. Most people know about the worldwide depletion of ancient underground aquifers, all of which take many years, decades, and centuries to replenish. The shortage of water in drought-laden California is the most observable problem we Americans face, with our reliance on California farms to supply large amounts of the produce we consume. And, in the Midwestern farm belt the Ogallala reservoir, which supplies most crop irrigation, is at least a third exhausted. What will happen in coming decades—with continuing drought conditions persisting, loss of topsoil, and toxic soil due to ongoing corporate farming practices that rely on GMO seeds containing a protein found in Bacillus thuringiensis (Bt) that protects the sweet corn from certain insect pests? The so-called breadbasket of the world is in deep trouble, many experts fear. There are too many similar examples of water problems to mention, but I think one foreign nation’s farming story needs publicizing: India. It is hard to comprehend that around 250,000 Indian farmers have committed suicide over the past 10-15 years (one every 30 minutes), primarily due to a series of devastating conditions, including long-term droughts, high-priced GMO seeds and pesticides, crop failures, bankruptcies (indebtednesses), and lack of ground water, which in some cases requires digging deeper, more expensive wells. A 2009 article in the Huffington Post noted that “More than 17,368 Indian farmers reportedly killed themselves in 2009, the worst figure for farm suicides in six years and an increase of 1,172 from the previous year’s figure.” Notably, there was also a huge drought in 2009. More recently, in 2014, a total of 5,650 farmers committed suicide. 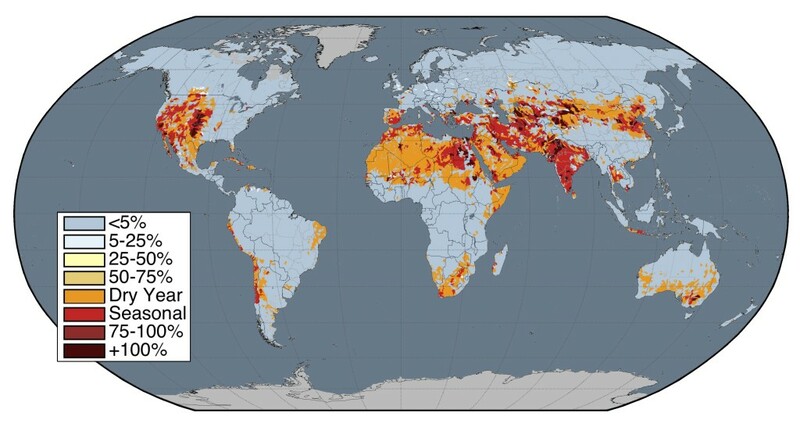 The map below shows annual, seasonal and dry-year depletion for 15,091 watersheds worldwide. The inclusion of seasonal and dry-year depletion estimates increases by 15-fold the number of watersheds experiencing depletion of 75% or more. Source: Kate A. Brauman et al., in Elementa, January 20, 2016. See: Water Risks Are Growing; Here’s A Tool To Help Us Prepare. Source: Kate A. Brauman et al., in Elementa, January 20, 2016. Water consciousness is growing almost everywhere, most noticeably with the current Flint, Michigan water crisis. Locally, media reporting of government-sponsored research reveals that approximately half of Minnesota’s many lakes and rivers are unsafe for swimming and fishing. Depleting aquifers are also a state concern, including the one lying below beautiful White Bear Lake, which has experienced a falling water level for several years, due primarily to aquifer depletion. As population increases, climate temperatures heat up, and drought becomes more common, water conservation measures will most likely be instated in many threatened areas. We Americans have been extremely fortunate to enjoy ample safe water. In taking our water for granted, we have been negligent in conserving it. 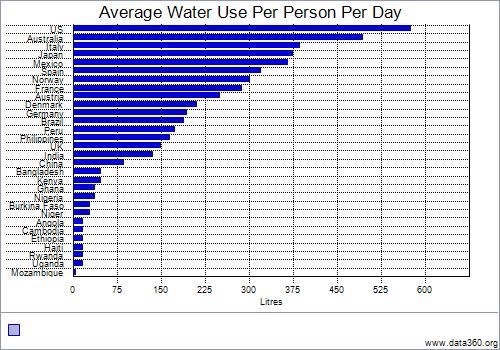 The following National Geographic chart indicates that each American citizen consumes an average of around 575 liters (150 gallons) of water per day. It’s interesting to note that most European countries use about half of what we consume. NOTE: No newsletter for the next four weeks, when we’ll be visiting Texas Hill Country. > EcoWatch: Hottest Year Ever Recorded + Collapsing Oil Prices = Broken Fossil Fuel Economy (Gary Wockner). Two overlapping news stories in the past few weeks must focus our attention on the need to move away from fossil fuels as quickly as possible and to transition our global economy to a more just and resilient system, especially for the world’s poor and vulnerable peoples. First, it was widely reported that 2015 was the hottest year ever recorded in human history. Climate change is real, is happening right now and seems to be accelerating in speed and intensity with every passing year. Second, global oil prices continue to collapse, now below $30/barrel. This sent world stock markets down and had a number of negative impacts on human rights issues around the world. > Resilience: Complexity, Short Term Volatility, The Exponential, And The Limits Of Human Cognition (Roger Boyd). The problem with complex systems, such as Climate Change, the Energy System, and Financial Systems, is that they tend to oscillate around a trend and can move in a counter-trend fashion for significant amounts of time. My own belief is that humanity has entered the period of transition and that the level of volatility will only continue to increase over the next few decades. The biggest danger is that the levels of uncertainty generated will drive people into either inertia, the search for the “strong man” that promises to maintain the unsustainable, or the blaming of others for their plight. Valuable time and resources will be squandered instead of used to help create a more resilient and sustainable society. > BBC News: Why Are Americans So Angry? (Vanessa Bradford). A CNN/ORC poll carried out in December 2015 suggests 69% of Americans are either “very angry” or “somewhat angry” about “the way things are going” in the US. And the same proportion – 69% – are angry because the political system “seems to only be working for the insiders with money and power, like those on Wall Street or in Washington,” according to a NBC/Wall Street Journal poll from November. Many people are not only angry, they are angrier than they were a year ago, according to an NBC/Esquire survey last month – particularly Republicans (61%) and white people (54%) but also 42% of Democrats, 43% of Latinos and 33% of African Americans. Five concerns: 1) Economy; 2) Immigration; 3) Washington; 4) America’s place in the world; and 5) Divided nation. > Resilience: Carbon Tax: The Low Oil Price Opportunity (Richard Heinberg). Carbon taxes constitute a widely discussed policy tool for reducing greenhouse gas emissions and slowing humanity’s headlong rush toward catastrophic climate change. Taxing energy from fossil fuels makes that energy more expensive, thereby making renewable energy comparatively cheaper. There are ways of reducing the economic hardship of higher energy prices (such as rebating some or all of tax revenues to low-income households so they can afford the gasoline or natural gas they absolutely need), but carbon taxes can be a hard sell for two reasons: first, a lot of people just don’t like new taxes of any sort; and second, energy is implicit in the entire economy, so a hefty carbon tax could make daily life more expensive in both obvious and subtle ways. > Peak Prosperity: Mass Layoffs To Return With A Vengeance (Adam Taggart). In the mass layoffs of 2008-2009 the US economy shed millions of jobs quickly and relentlessly, as companies died and the rest fought for survival. After the Fed and the US government flooded the banks and the corporate sector with bailouts and handouts, the nightmare of 2008 soon became a golden era of ‘recovery’. Well, 2016 is showing us that that era is over. As stock prices cease to rise, and in fact fall within many industries, layoffs are beginning to make a return as companies jettison costs in attempt to reduce losses. Economic news since January 1st reveals major cutbacks by large corporations, including Johnson & Johnson, Wal-Mart, GE, BP, Macy’s, Sprint, and several others. Many companies are related to the Energy, Finance and Tech sectors — the three biggest engines of growth, profits and market value appreciation within the economy over the past 7 years. Time for Plan B? > Resilience: The Empire Of Lies (Ugo Bardi). During the past few decades, the mountain of lies tossed at us by governments has been perfectly matched by the disastrous loss of trust in our leaders on the part of citizens. Today, every statement from a government, or from an even remotely “official” source, seems to generate a parallel and opposite statement of denial. Unfortunately, the opposite of a lie is not necessarily the truth, and that has originated baroque castles of lies, counter-lies, and counter-counter lies. Eventually, it is a problem of epistemology. The same that goes back to Pontius Pilate’s statement “what is truth?” Where are we supposed to find truth in our world? > National Geographic: Water Risks Are Growing; Here’s A Tool To Help Us Prepare (Sandra Postel). Earlier this month, the World Economic Forum in Davos, Switzerland, released its annual risk assessment, which looks across the spectrum of threats to society and ranks them. This year, it declared water crises to be the top global risk to society over the next decade. Just behind water crises were the failure to adapt to climate change, extreme weather events, food crises and profound social instability. Together, these five threats constitute an interwoven risk landscape that has water shortages, in one way or another, at its core. > MN Environmental Partnership: Minnesota’s Own Water Crisis (Hanna Terwilliger). The water crisis in Flint, Michigan has many across the state worried that a similar situation could impact Minnesota. Like many states across the country, Minnesota has an aging water infrastructure system. While high-lead levels are unlikely to pop up in local drinking water, Minnesota has its own set of pollutants that pose serious threats to the health and well-being communities across the state. Northern Minnesota suffers from high levels of mercury, where 1 in 10 babies are born with unhealthy amounts of the toxin in their bodies. Mercury affects neurological development in infants. One of the primary sources of mercury pollution in our lakes and rivers is coal-fired power plants. Also, across southern Minnesota, high nitrate levels are cause for concern for many communities, where a 2015 Minnesota Department of Health report warned that nitrate contamination was a growing threat to public health. > E&E Publishing: From Fad To Fixture: How Investors Are Waking Up To Climate Risk (Benjamin Hulac). Historically, investors haven’t worried about how climate change or greenhouse gas-cutting laws might affect their ledgers. But as a growing number of money managers, Wall Street traders and regulators agonize over climate change costs, that stance has shifted from apathetic to alert. “Environmental and social scandals are showing up in stock price crashes,” said Verity Chegar, an analyst at BlackRock Inc., which manages $4.6 trillion. > NPR: Mapping Zika: From A Monkey In Uganda To A Growing Global Concern (Mark Silver). The Zika virus has gone from an obscure disease to an international public health emergency. Researchers have been able to trace the gradual spread of Zika — slowly for decades and then, in the words of World Health Organization head Dr. Margaret Chan, “explosively” since 2015, when it was first detected in Brazil. Now the virus has reached more than 20 countries and territories in the Americas. In Brazil, there have been 500,000-plus cases. Thousands of babies have been born in Zika-affected regions with the birth defect microcephaly (although a causal relationship has not yet been scientifically established). > Star Tribune: Free Recycling Of Your Old Tvs And Monitors Is On The Decline (John Ewoldt). Best Buy, which now collects one-third of all electronic waste in MN, joins Hennepin County and Carver County and many other government recycling agencies across the country that now charge nominal fees for disposal. Consumers are starting to see fees for several reasons. Commodity prices have declined by as much as 50 percent for copper, aluminum and steel. The glass in CRT monitors and TVs is heavy and difficult to recycle. > Yale Environment 360: Once Unstoppable, Tar Sands Now Battered From All Sides (Ed Struzik). Canada’s tar sands industry is in crisis, as oil prices plummet, pipeline projects are killed, and new governments in Alberta and Ottawa vow less reliance on this highly polluting energy source. Is this the beginning of the end for the tar sands juggernaut? Over the past four decades, tar sands operations have destroyed roughly 300 square miles of boreal forest and wetland habitat. Large amounts of water are used in the mining process, and the industry has created 70 square miles of toxic tailings ponds that have yet to be cleaned up. The mining and refining of tar sands crude also creates significantly more greenhouse gas emissions —as high as 37 percent more — than producing conventional crude oil. > Associated Press-Yahoo News: Facts And Figures Show The Impact Of Low Oil Prices (Staff). The impact of sharply lower oil prices is being felt around the globe. Oil-dependent countries are trying to mend busted budgets. Oil companies are cutting production and workers. While consumers in some countries enjoy lower gas prices, elsewhere consumers are paying higher food prices due to declines in the local currency. The government estimates U.S. production will fall to an average 8.7 million barrels a day this year from 9.4 million in 2015. > The New York Times: Obama To Propose A $10-A-Barrel Fee On Oil (Coral Davenport). The $10 per-barrel fee, which could bring in up to $32 billion in new federal revenue annually, would be spent on a variety of transportation and infrastructure projects, including bridges and highways, high-speed rail and research on advanced vehicles such as electric and self-driving cars. The proposal to further increase costs for fossil fuel production is part of a broader effort by Mr. Obama to fight climate change. > National Geographic: Has The U.S. Really Reached A Historic Turning Point In Energy? (Wendy Koch). Solar panels added a record amount of capacity to the power grid last year, and wind farms saw their capacity jump 65 percent as developers sought to take advantage of a federal tax credit slated to expire, according to the BNEF data. In December, Congress renewed wind and solar tax credits for another five years. As a result of the growth in both natural gas and renewables, the U.S. power sector recorded the lowest yearly carbon emissions—down 4.3 percent from 2014—since 1995. In fact, these emissions are now 17.8% below 2005 levels, the benchmark against which the Environmental Protection Agency’s Clean Power Plan set a goal of a 32% emissions cut by 2030. > Foreign Policy: If You Think Europe Has A Refugee Crisis, You’re Not Looking Hard Enough (Christian Caryl). Europe isn’t the front line of the world’s refugee crisis. Media reports rife with images of people trailing through Hungarian fields and crowding onto rickety Mediterranean fishing boats would have us think that it is. Yet the global reality is starkly different. As the following data show, the overwhelming majority of displaced people are living in countries that don’t really have the resources to host them — a trend that’s unlikely to abate and one that has ominous implications for the future. Lebanon, Jordon, and Ethiopia are particularly hard hit. > The Washington Post: Pentagon Unveils Budget Priority For Next Year: Countering Russia And China (Missy Ryan). The Pentagon unveiled a proposal Tuesday to boost spending on advanced weaponry and the U.S. footprint in Europe, part of a plan to refocus the defense budget to counter technological and military advances by Russia and China. On Tuesday, Defense Secretary Ashton B. Carter previewed the Pentagon budget proposal for fiscal 2017, making a case for why China’s rapid military buildup and Russia’s intervention beyond its borders pose a bigger danger to U.S. security, and merit larger investments, than does the immediate threat from the Islamic State. > Resilience: The Commons Is The Future (Yavor Tarinski). The paradigm of the commons, as part of the wider project of direct democracy, could play the role of the trick of the vanishing table, separating us, but simultaneously creating strong human relationships, based on solidarity and participation. And for this to happen, social movements and communities have to reclaim, through the establishment of new networks and the strengthening of already existing ones, the public space and the commons, thus constituting coherent countervailing power and creating real possibilities of instituting, in practice, new forms of social organization beyond states and markets. > MPR: Minnesota Companies Moving Forward On Climate Change (Paul Huttner). MPR’s Climate Cast was held on Jan. 28th at Minnesota’s 3rd Climate Adaptation Conference. Minnesota companies like Best Buy, 3M, and General Mills, as well as cities are increasingly on the front lines of climate change in coping with increased extreme rainfall events and flooding, dramatically warmer winter temperatures, and changing snowfall patterns. In many cases, cities are coming up with climate adaptation and mitigation plans on their own. It’s a sort of grass roots municipal climate change movement. Cities are also saving money while reducing their carbon footprint. Acting locally to deal with the growing symptoms of a global problem. > The Guardian: From Liquid Air To Supercapacitators, Energy Storage Is Finally Poised For A Breakthrough (Damian Carrington). 2016 industry figures are predicting a breakthrough year for a technology not only seen as vital to the large-scale rollout of renewable energy, but also offering the prospect of lowering customers’ energy bills. Big batteries, whose costs are plunging, are leading the way. But a host of other technologies, from existing schemes like splitting water to create hydrogen, compressing air in underground caverns, flywheels and heated gravel pits, to longer term bets like supercapacitors and superconducting magnets, are also jostling for position. > MinnPost: It’s Time To Take A Huge Step Forward On Water Quality In Minnesota (Paul Austin, Gene Merriam, Darby Nelson and Dave Legvol). Gov. Mark Dayton announced recently that he plans to call a water quality summit in late February to address the myriad issues facing the state’s water supply. With this announcement, Minnesotans have been given a tremendous opportunity. The summit is a chance for the people of Minnesota to have their voices heard, and for state leaders come together behind the information gathered as a part of the summit to put Minnesota on a clear path to clean water. > Think Progress: Could The Future Of Urban Farming Be Found Inside An Old Shipping Container? (Natasha Geiling). When Michael Bissanti opened Four Burgers in Cambridge, Massachusetts in 2008, he knew he wanted to create a fast food restaurant with a strong sense of sustainability. That’s why Bissanti is one of more than 50 farmers across the country growing produce in refrigerated shipping containers known as Leafy Green Machines, created by the Boston-based start-up Freight Farms. Outfitted with vertical hydroponics and LED light systems, the Leafy Green Machines are 320 square-foot self-contained farming units that can grow as much produce as two acres of farmland using less water per day than the average American needs for a single shower. > Resilience: Democratic Energy And Climate Change (Yavor Tarinsky). The capitalist economic model and the statist top-down decision-making processes are essentially predisposed towards enforcing, not preventing the ecologic crisis. This poses the need of a holistic systemic alternative, compelling us to think outside the dominant institutions and come up with new ones that already exist in the margins of society. One such proposal is the creation of democratically managed utilities, like energy cooperatives or commons that are managed by the communities that use them. Such a model strives at local sustainability and satisfaction of human needs (reflected by its participatory character) instead at profiteering and growth. > Citizens for Sustainability: Meeting-Forum, Sat., Feb. 13, 10am-noon, Silver Lake Village Community Center, 3301 Silver Lake Rd. Also: Mar. 12 (same time and place).